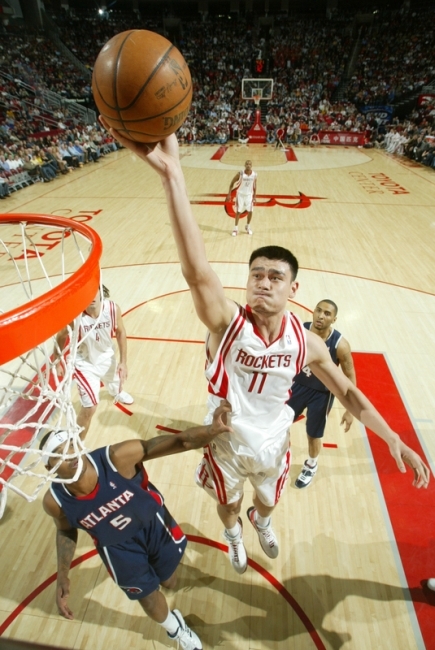 After arriving back in the U.S. from China on Friday the 22nd, Yao attended the Rockets-Hawks game on Monday night. He worked out at Toyota Center earlier in the day. 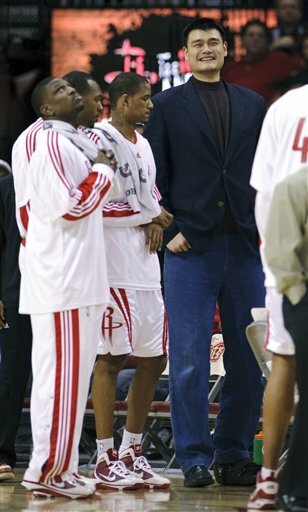 Notice how Yao no longer needs crutches, but he’s still wearing his protective boot. It’s clear the Rockets, who lost their second straight game at home and haven’t been playing very well lately, are really missing Yao these days. Some fans who thought the Rockets might not need Yao when they were hot earlier in the season are definitely thinking he would be a valuable asset to have now. With Ron Artest‘s sprained ankle forcing him out of the lineup for Saturday’s game in Atlanta (like Tracy McGrady and Shane Battier), the team’s poor play lately, and it being the second game of a back-to-back, the Rockets had almost no chance of beating the Hawks in Atlanta where they are 14-2 at home this season. 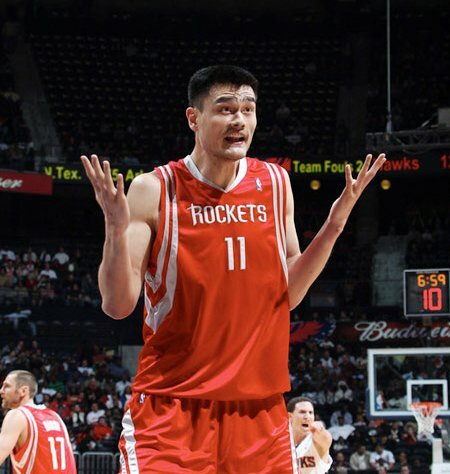 Yao Ming reacts after the refs don’t cut him any slack in a frustrating second half against the Hawks. Click here for more photos of Yao during the game. But like other times this season after losing games in embarrassing fashion, the Rockets’ role players showed up and played with hustle and guts and almost pulled out a miracle win, but they lost on a last-second 3-pointer from Mike Bibby with 1.5 seconds remaining. Aaron Brooks had a chance to tie the game with a 3-pointer at the buzzer, but the shot just rimmed out as time expired. Hawks 103, Rockets 100. The Rockets have now lost 5 of their last 7 games, and their 21-14 record is not holding water in the ultra competitive West. With Saturday night’s loss, they are in a battle for 8th place: on the bubble for a playoff spot. Every loss like the ones they’ve had recently makes a big difference at the end of the season where one win or loss can make or break you. I normally don’t embed too many YouTube videos on the site since the NBA is known to shut those videos down, thus leaving a gaping hole in this site. But here’s one from the end of the game against Atlanta on Wednesday night. I love Bill Worrell’s commentary, from the ‘finest hour’ comment to McGrady’s 3-pointer. I guess enjoy it while it’s still up. It was a beautiful scene in Atlanta where the Rockets won their 20th straight game Wednesday night. The game was filled with anticipation as Houston had to make big plays in the fourth quarter to pull out the victory after a poor shooting night (33%). No Yao, sucky shooting (33%), their point guard hitting only 3 shots out of 18, missing athletic throw-down king Carl Landry for the 3rd straight game (huge), Luis Scola‘s early foul trouble, and Tracy McGrady shooting 20% by halftime, just to name a few. Yet they still pulled out a win when they needed it, incredibly winning their 20th straight game in an 83-75 gutcheck victory where they could care less about winning in double-digits again, and were just ecstatic to keep the streak alive and hit that magical ’20’ mark which gives ties them for the 2nd longest winning streak in NBA history. 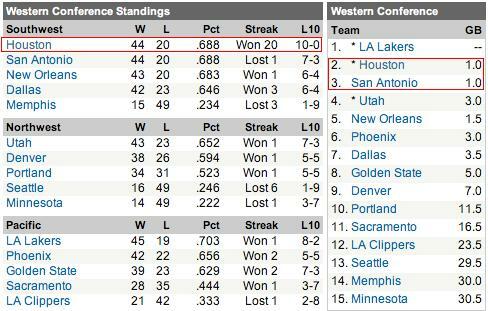 With the victory, the Rockets are now the second seed in the West after San Antonio lost to New Orleans Wednesday night. Take a look at the image of beauty below, including that ‘20’ in the streak column. I don’t want it to end. Savor it while it lasts. This was absolutely one of those games where the “Yao effect” was clearly evident. If Yao had been in this game, it would have been much, much easier to score when other Rockets’ shots kept missing. Fortunately, McGrady put his team on his back when they REALLY needed it — I think even much more than what they got from him at Saturday’s home game against New Orleans when he scored 41 points in 48 minutes. This time around, no one was doing much damage offensively, and I felt watching this game that he was their last option. Accompanying the team to Atlanta, Yao practiced with the team before Friday night’s game the Hawks. Later, the Rockets lost a game they should have won. Click here for more photos from Yao’s practice. Yao made the trip to Atlanta to join his teammates on their short 2-game road trip to Atlanta and Orlando. He jokingly said it was because he wanted the “road trip per diem,” but it was really to learn some of the new plays they have put into their playbook the past 8 weeks while he has been injured, and to get used to the pace of being on the road again and the intensity of the crowd, among other reasons. (You can check out a more extensive interview of Yao’s progress by reading this earlier blog post). Yao practiced before the game and later worked out during the game itself. He said he hopes to be ready to play in a week to 10 days, although he admits he won’t be medically cleared to play until after that. You can read more about his thoughts on returning iback to the lineup in this short Houston Chronicle article. Regarding the game that was played while Yao worked out, you would have thought the 21-33 Atlanta Hawks were the Phoenix Suns Friday night. Houston’s league-leading defense couldn’t stop the league’s worst-shooting and lowest scoring offense in a 105-99 loss. The Hawks seemed to score at will most of the game, shooting 47.4% for the game. They gave up 19 second-chance points, second only to the 22 they gave up against Denver in another devastating defeat earlier this season. When you see performances like this, it makes you think the success the Rockets have experienced without Yao playing could be a house of cards that could come tumbling down at any moment. The game was fairly close all night long, and the Rockets had a chance to build a lead in the fourth quarter that probably would have been insurmountable for a young team that hasn’t “learned to win” yet, as they say. But the Rockets missed 5 free throws in the pivotal fourth quarter, with Bonzi Wells and T-Mac missing two FTs each. As bad as the defense was, those missed free throws were the a big ifference maker. Maddening. Atlanta is clearly more athletic than the Rockets, with high-flyers like Joe Johnson, Marvin Williams, Josh Smith, and Josh Childress. When Houston doesn’t play good defense, like getting burned by Johnson multiple times coming around screens for open shots, or Chuck Hayes slacking off and not blocking out Johnson on the boards to prevent a follow-up dunk, that’s inexcusable. The Rockets now go to Orlando and play a team that’s better than Atlanta. The Magic are 27-29 and have Dwight Howard, who is athletic and sure to wreak havoc on the boards against Houston. Howard is not only the Magic’s leading rebounder (12 per game), but also leads the team in scoring (18 ppg), field goal percentage (59.9%), and blocks (1.8 per game). I was on a plane during the Rockets’ 94-68 blowout of the Atlanta Hawks Friday night, so I haven’t been able to watch the game yet. However, I plan to watch it on my Tivo over the weekend, and maybe post a few observations that perhaps the Houston Chronicle didn’t already write about the game. I am hardly believing my eyes seeing routs like this one — and the one in New Jersey on Wednesday night — with T-Mac back in the lineup so recently after coming off the inactive list with back spasms 3 games ago. He dominated by putting up 31 points, and probably could have put up even more if he hadn’t got his thumb whacked midway through the third quarter. I know it’s only the woeful Hawks we’re talking about, but a win like this one is still impressive because it shows that T-Mac’s back may not be as bad as we thought it would be. 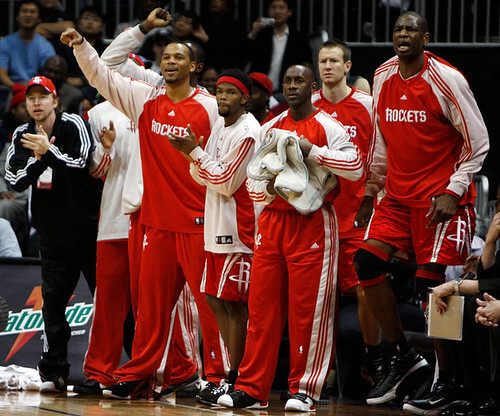 It also shows the Rockets are not going to curl up in the fetal position now that Yao is out. When Jeff Van Gundy compliments his players about playing with great passion, and Juwan Howard (17 points, 13 rebounds, 5 assists) and Dikembe Mutombo (14 boards in just 22 minutes) turn back the clock ten years, you’ve got to give them lots of credit for giving fans hope that maybe they can still make the playoffs even with Yao’s absence over the next 6-8 weeks. MONDAY, 1/16/06 – I have a dream that one day…the Rockets will have all their players back, make the playoffs this season, and shock the world by winning a couple of playoff series. That dream is a stretch after seeing Houston lose 94-83 to Atlanta, a team that is now 10-26 with the worst record in the league. The Rockets aren’t too far behind with a 12-24 record. If there was ever a game the Rockets could win without six players injured, this was going to be it. The Hawks were playing their fifth game in 7 days. They had lost four in a row. But unfortuntately, the Rockets were without T-Mac for the fourth game in a row, resulting in Houston losing its sixth straight. The Rockets are now 0-12 without T-Mac. To read more of the depressing details from the game, click here for the story. The good news is that Yao, who has missed 13 games in a row because of the surgery he had on his big toe, may be back in action in about two weeks. ‘Reunited and it feels so good.’ Yao and T-Mac play in the same game on Tuesday night for the first time in five games. Both Yao and T-Mac scored 25 points in beating Atlanta, 100-85, to snap their 7-game losing streak. For more photos from the game, click here. 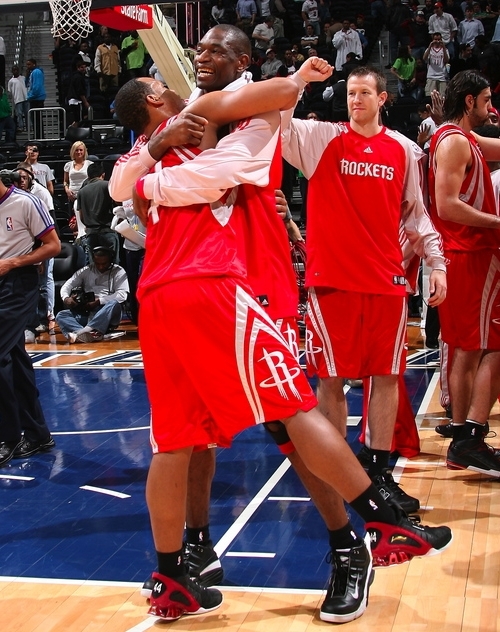 TUESDAY, 11/29/05 – I was ecstatic to hear before the Rockets game against Atlanta that T-Mac would play! It felt like Christmas 26 days early! After watching McGrady’s impact on the team Tuesday night and seeing his team defeat the Hawks 100-85, it will be fun to watch the Rockets try to dig themselves out of their 3-11 hole (now 4-11). Okay, maybe I’m getting ahead of myself since Atlanta (now 2-11) is not Detroit or San Antonio. It’s still not going to be easy. It’s amazing the difference that T-Mac made right out of the gate, scoring Houston’s first six points. Since it had been 11 days since his last game action, he had to ask coach Jeff Van Gundy for a break at the 6:16 mark of the first quarter because he was so winded. However, he came back a few minutes later to finish the quarter with 12 points on 5-of-8 shooting, and pushed Houston to a 26-22 lead heading into the second quarter. Can it get any more obvious how valuable he is to this team? You are currently browsing the archives for the vs. Atlanta category.